The first-ever nuclear power station (5 MWe) was built in the USSR and began operation in 1954. 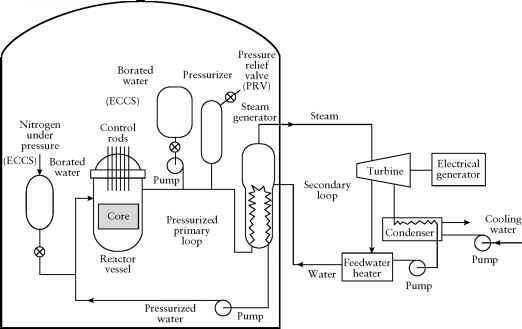 Its reactor was fueled with uranium metal (5% 235U), moderated with graphite, and cooled with pressurized water that flowed through a primary loop and then through a heat exchanger to generate steam in a secondary loop. 34The core of a BWR plant with an electrical capacity of 1000 MWe contains about 125 metric tons of LEU as U02. to boil and generate steam in the core. In a 1000-MWe RBMK (RBMK-1000), the steam goes to two 500-MWe generators from two halves of the reactor that can be operated separately. The RBMK was the most popular type of civilian power reactor in the Soviet Union prior to the Chernobyl accident in 1986 (see Section 14.16.2.3). These reactors can be refueled while operating, and they allow the use of low-enrichment fuel. Although large water-cooled, graphite-moderated reactors had been operated safely in the United States from the time of the Manhattan Project in the 1940s until 1994, they were used primarily for the production of Pu for nuclear weapons. Some also generated electricity, but as a type of reactor, they were never developed for use in U.S. commercial power plants. The last of these, the N Reactor at the Hanford Reservation in Washington State (near Richland), began operation in 1963 and was permanently shut down in 1986 after the Chernobyl accident. Although these reactors had many design features to make them safer than the RBMKs, they lacked a major safety feature, namely, a containment building.